We recently upgraded our equipment to new Dell Laptops such as the Precision M6800 and now Snap Deploy does not recognize network when trying to deploy an image using a bootable CD. We encountered this same issue a year ago and the fix for this was a new build of Snap Deploy that we installed and it worked. Seems like every time we upgrade to new hardware we encounter this issue. I noticed that the Stand Alone utility does not recognize the ethernet adapter either so im wondering if it has to do with the Ethernet adapter or the drivers for it. Is there anyone out there that is encountering this issue? Build 540 is the latest upgrade that we are using but there hasn't been other builds available I believe. We need this fixed soon we have a massive lease coming in the near future in which we will be imaging numerous computers at the same time and we are hoping Acronis will come up with a solution for this if not we will need to move on to other imaging software. The build 540 not support a network-card l217-LM. I have the same problem with my HP PROBOOK 600 G1 machines. I've sent you private messages with download link of the update build. Thank you so much Anna Trifonova. I am also having this issue with 540. Would you send me the link for the updated version also? It worked! Thank you Anna! Could you please send me link to new build too? Anna thank you so much I can confirm that the new build is now seeing the 1217-LM Ethernet NIC cards for the Precision M6800's. Just need to try them out on the Latitude E6540 they should work in theory since its the same NIC card. i have also a problem with a Intel I217-LM Network Card, it is in a HP EliteDesk Desk 800 SFF. When trying to PXE boot the network card is not recognized. I have Acronis Snap Deploy 4 v.540, please could i get the build 4 v.582. I read there is the NetworkDriver in. Is this right? Thomas, Glendon, Alexey, I sent you private messages. Sorry for the delay. I sent you a private message. Can you send me the link as well. I am having the same issue. Thanks. Pepco, Nicholas, I've sent you links. We just got a Lenovo T540 and are having issues with it detecting a NIC. Can you send me the same release please ? you can find download links in your inboxes. May I get this as well please? Having the same issue with our new HP 800 systems. I sent you the link. can you send me the link as well. I am having the same issue with Intel Ethernet Connection i217-v. Thanks. Having the same problem with the new NICs. Could I please get the link for the updated build? Thank you. Pascal, pingjock, Thomas, I've sent you private messages. Can you give me the new build aswell? Thank you. Anna, I sent you a PM. Can you send me the link to the new build? We have HP 3515s with Atheros AR8161 PCI-E gigabit ethernet controller. I installed the patch, now the SD server is seeing the workstation when I power it on with the bootable media in it. On the server side, I give it a name, domain and select image to deploy. On the workstation side, the screen with the message "...ready for deployment..." is up but nothing happens after that on the workstation. On the server, the workstation status goes from ready to failed with out any message as to why? I have the same problem and have a lot of machines to deploy, can you send me the update build link. I am having this same issue with version 540 on our new Dell Latitude E7440 laptops, and Precision T3600 desktop. I'm in the process of creating a new image. The workstation that I am trying to image is a replacement model of what the image is from that I am trying to use. I haven't finished yet so I'm not sure if this will fix my issue. I figured I would post what I was trying to see if that will hlep anyone else. I'll post if I was successful/unsuccessful. Martijn, Robert, xianx x, Keith, I've sent you links. Nicholas, I answered your private message. We are also on version 540 and experiencing issues with new dell computers. Could i get the link to 582 please. Sure, Jason! The link is in your inbox. I created a new image for this model of workstation since it is a newer model than my previous images were for. With the new image, the sever now starts the deployment, it gets to 4% and then fails. On the workstation side, I see where it starts downloading in the Total Prgoress bar but once it fails on the server side the Rate goes to 0 byts/sec. I looked at the logs on the server and see an error code 48(0x330030). Any help with this would be greatly appreciated, I'm getting behind on deployments. Anna, I currently have version 540, any chance I could also get the link to the 582 update please? I am also in need of the newer build. Clearly this is a major problem for many folks (I am a dell shop also)....so why hasn't Acronis released an update to address this problem? If you could send me the link to the latest build, that would be very helpful. Well I got off the phone with tech support after 1.5 hours, tech support said it was "usually not recommended to install a custom build" meaning the 582 patch. After that awesome phone call he recommended for me to repair the patch and reboot, I'm sure it was to get me off the phone. After being cut off several times while I was speaking and doing the same steps over and over again with out chaning anythign he told me to repair the software and reboot. Geuss what.... it didn't work. Hallo, i have the same issue with the nic driver. Can you send me the link please. I've sent you private messages with download links. Micky, an update for Acronis Snap Deploy will be published soon, but the exact date is not available yet. Nicholas, I found your support case and please be sure, we will do our best to help you as soon as possible. the same problem with HP zBook 17. Can you send me the link, too? I have the same problem with the Lenovo T440 and T540 with the I217-LM NIC. Can you please send me the link for the 582 build as well? 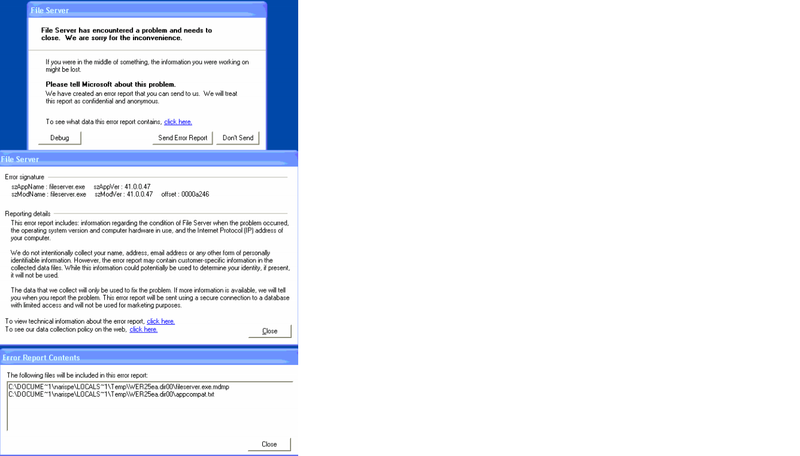 I attached a screen shot of what comes up after the deployment shows failed. This message comes up 5-10 min after. I never recieved this before until I installed this patch. When I look at the .txt file it looks to be from Acronis. I also attached the .txt file from the path in the error message. This is probably the cause of my problem, pleae let me know how I should proceed in resolving this problem. I have tried doing a repair multiple times, with the same out come. I'm having this same issue with HP Prodesk 600s. Please can you send me the link to the updated build? Nicholas, thank you for information uploading. Please wait for further instructions from support professional in your support case. We are using new Lenovo ThinkCentre M73. They have Realtek PCI3 GBE Family Controller. I am unable to use the boot disc that Acronis 11 Workstation creates without complete system lockup. Is there a patch for this? Spectrum IT, I'm having similar issues as well are your Lenovo's Model Type: 10B6-0009US ? That is the model type that I am having issues with. Anna, can you tell me what this error code means? 0x340001 I couldn't find anything in the kb articles. Now it works. Thank you! Thank you. Build 582 fixed the problem I was having.